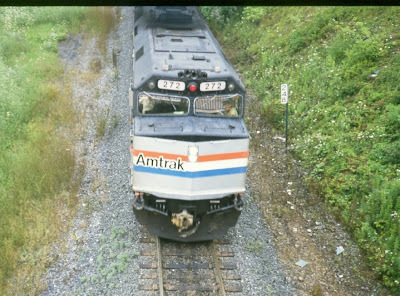 In early April, I had this vision of posting several images of Amtrak trains from my personal archives, and I failed miserably in doing so. However, before I let go of that disappointment completely, I wanted to post a few images for my reader out in the western part of the Keystone State. First is a shot of Amtrak 272 preparing to make its way through an underpass in Gallitzin. It had just exited one of the tunnels that makes the little town a big draw for railfans. I took this in early August, 1984. 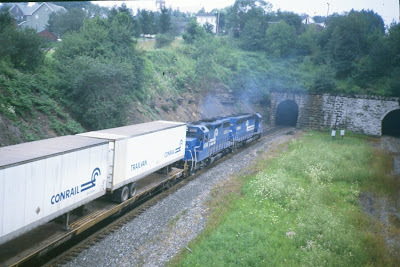 Here is a shot of a Conrail van train at the other tunnel entrance. 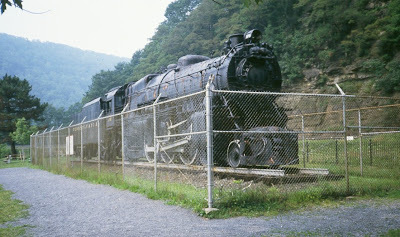 Finally, here is a shot of Pennsylvania Railroad 1361, a K4 that sat at Horseshoe Curve for many years. She looks rough and rusted in that photo. A year or so later, she would be removed from the static display and restored to operating condition. PRR 1361 ran some excursions before encountering some serious structural problems. A long running major restoration effort has been undertaken, and it has undergone several starts and stops. In some ways, this engine has withstood a very long existential crisis.